An Opinion On Sports: Some Hard Hittin' Goin On! 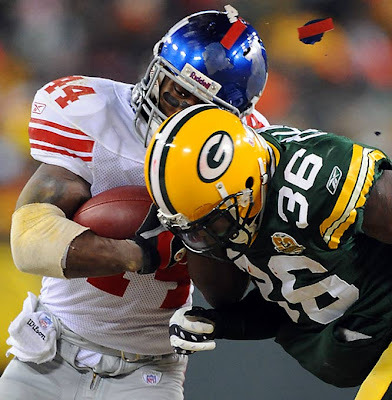 Nick Collins of the Packers lays a little 'smack down' on the Giants Ahmad Bradshaw in last year's NFC title game. Notice the paint, stripes, and numbers flying off Bradshaw's helmet. Nothing like a little head-to-head competition! This shot made SI's Best Shots of the Year.